It is time for an update on the journeys of Curiosity and Opportunity on Mars! First, Curiosity. Though the science team has not yet updated the rover’s Mars Reconnaissance Orbiter traverse map showing its travels, it appears from Curiosity’s most recent navigation camera images that the rover has moved passed the first butte that had been ahead and directly to the south in the traverse map shown in the last image of my post here. The image below the fold, cropped and reduced to show here, looks ahead to the second butte and the gap to the south. Beyond Mt Sharp can be seen rising up on the right, with the upcoming ground open and relatively smooth. The only issue will be the steepness of that terrain. Based on my previous overall look at the rover’s journey, I suspect they will contour to the left. Meanwhile, Opportunity has moved into position directly above Lewis & Clark gap and has taken a picture looking directly down the slope. The image below shows this slope and is from the rover’s most recently released navigation camera images. I have reduced its resolution slightly to show here. They appear to be preparing to head down. I’m looking forward to them getting deeper into Endeavor crater. That will be the kind of exploration we got a taste of when Opportunity ventured part way into Victoria crater a few years back. The slope looks similar but without hard data one can’t be sure. 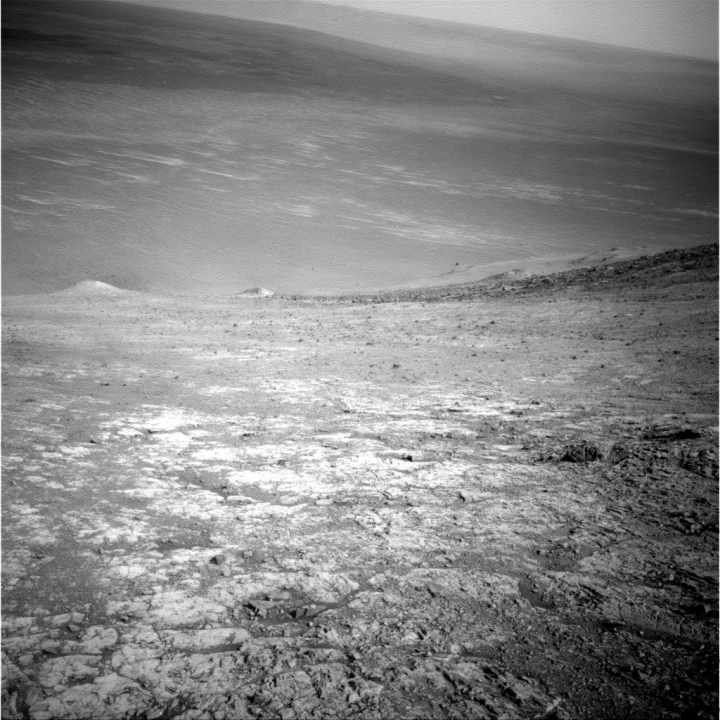 Additionally, if I remember correctly, the path Opportunity took into and out of Victoria was almost all on solid rock, this path down into Endeavor looks to be a mix of rock outcroppings and soil. The rover likely won’t have trouble getting into the crater, but climbing back out might be an interesting task if it’s wheels slip in the soil. In either case, the trip will be well worth it and the navigators might find another path out somewhere else along the crater rim so all would not be lost even if Opportunity couldn’t get back out the same way she gets in, the thing is 14 miles across after all.